I signed up for this swim a few months ago thinking it was a good idea. Roughly 1 month prior to the event, I realised it was not such a great idea and it was going to be tough. 12 hours of night swimming in a lake in May. 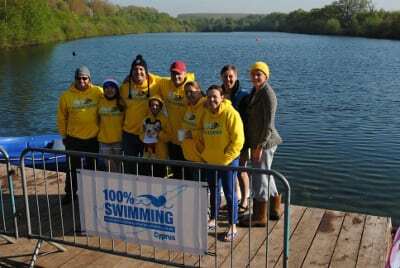 Open water swimming in May is usually 1 mile every couple of days – not 1 mile per hour all through the night. When it snowed at the end of April I think it safe to say we were all more than a bit concerned about this swim. Sunday 1st May saw us swimming in 9 degrees. I have some big swims planned this summer and the 12 hour swim is just a training swim so it didn’t make any sense to put my body through such stress for a ‘training swim’. So, I was considering withdrawing. However, the weather forecast looked favourable so my support team and I made plans. The neoprene swimsuit, socks, gloves and the wetsuit were always going to be in the kitbag. I may be a ‘skins’ swimmer but even I considered it foolish to only take costumes. A rubbish nights sleep and a Saturday morning at work didn’t make for good preparation for the event. I did manage to get an hours sleep during the afternoon so, more fortunate than other participants. Fortunately, the weather changed and it couldn’t have been better conditions. A beautiful venue and we felt quite organised so, itching to get started. However, I was still open minded about using the wetsuit even during the briefing. It might have been warm, sheltered and tranquil but still a bit of an unknown for 12 hours of night swimming. 1st mile – easier than expected getting in. Oh, what a pleasant surprise – the clarity of that water. Just beautiful. Used the 1st mile as a warm up, find my bearings, things to sight for, find a steady rhythm. Time was approx 28ish minutes and I was nicely relaxed when I got out. We’d put chairs by the entry/exit point and my plan was to dress and relax there in order to save time traipsing back to the tent every hour. (I didn’t actually visit out tent until after the event had ended). Ella – my daughter – had all clothes and a hot drink at the ready so, I had around 20 minutes sit down until preparing for mile 2. Mistake number 1 occurred here. I felt great so didn’t eat. Mile 2 – fast. Felt brilliant! Faster than mile 1. Got out happy, dressed quickly and another drink. I felt great so, hardly had anything to eat again. Mile 3 – not so fast. In fact, rubbish! Paying the price for not refuelling straight away. I love food so don’t understand why I hate eating between swims but I really do find eating difficult during events. Anyway, pasta, peanuts, and a gel so, mile 4 felt a bit better but still sluggish. I’m cross with myself for not feeding earlier. I had the shivers after mile 2 & 3. Leon was a bit concerned about me but I’m quite sure it was down to the lack of food. I thought the hardest thing about this event would be getting back into the water every hour after I’d gotten dry and warm but that was actually quite easy and the least of my worries. After mile 3, I used the changing rooms to go and warm up and fuel up between swims which worked nicely. I couldn’t see the point of going into the warm dry room as I thought it would be too much of an extreme to back into the water after a warm room. It was quite hard initially swimming in the dark as the buoys were a bit tricky to spot. However, Paul (my other half) usually kayaks for me and he’s well lit up so, it’s easier to just swim next to him and not bother trying to sight the buoys until I’m nearly on them. The water was flat calm and peaceful. Even in the dark, it was nice and clear so the light from Paul lit the plant life up beautifully. 2, 3 and 4 o clock in the morning were by far the best miles. The Stars were out. It became easier to sight. I’d recovered from the lack of fuel earlier on. My shoulders were a bit sore and I had to have some paracetamol but nothing too bad. I was having a gel every hour. Not good practice really but it worked. I knew I didn’t need any neoprene and I knew I could plod through the rest of the event. The 5 o clock swim was nice with a bit of mist and the birds singing to us. I thought it would warm up for the 6 & 7 o clock swims but they were actually the coldest times as the air was quite cool. 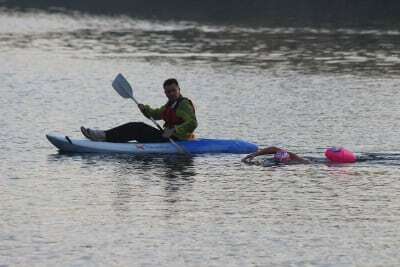 The kayakers weren’t required for those last 2 miles as it was daylight but I asked Paul to stay with me. After 10 miles, who knows how much you’ve got left in you – I felt I needed that extra safety. Also , I had muscle aches in the last 2 miles in muscles that I’d not really used. That was annoying. Chatting with Richard Powell afterwards, I realised that it was lack of electrolytes. So, overall, I have to say that this swim was a lot easier than I expected. Thoroughly enjoyable and a hell of a learning curve. I must sort out my feeding plan. I’d had 11 gels throughout the night. They worked for the event but ooh, my joints are hurting bad now. Inflammation from all that sugar! YOS Member, Competitions Organiser and Swimming Coach. Photos by YOS Member and Photographer Sarah Pearson.